The pre-Cambrian hematite schist formations located at Marampa were discovered in 1926 by Major N.R. Junner, a geologist with the Gold Coast Geological Survey. Exploration of the Marampa deposits followed quickly between 1927 and 1930 by the African and Eastern Trade Corporation Ltd, a shipping company. Estimates suggested there were twelve million tons of hard lateritic hematite ore in the deposits. Whilst the exploration was underway the company merged with the Niger Company in 1929 and renamed United Africa Co Ltd. The publication of a geological survey in 1927 about the Marampa deposits drew the attention of William Baird & Co Ltd, of Coatbridge, Scotland. Further research by William Baird & Co Ltd led to the incorporation of the Sierra Leone Development Co Ltd (DELCO) in 1930 with William Baird & Co Ltd and the Northern Mercantile & Investment Co Ltd each owning 47.5% of the company, the remaining 5% belonging to United Africa Co Ltd. In 1930 the African and Eastern Trade Corporation Ltd transferred its leases to DELCO and officials from Spain were relocated to Sierra Leone to develop the mine and construct the railway and harbour facilities. The mine and port equipment was built by Fraser and Chalmers Engineering Works. At Marampa, this included complete washing, screening and loading equipment for the washed ore; conveying and storage equipment for the washed fines; conveying and storage machinery for the concentrates; and the concentration plant. At Pepel, this included a storage and handling plant for the washed fines and concentrates. All the motors, switchgear, sequence control and distribution equipment was designed by Witton Engineering Works. The ore was brought to the processing plant in mine tubs and discharged by the mine tipplers into conical hoppers. These hoppers discharged the ore onto shakers, then double deck screens where the ore was washed. The oversize was fed to a 24” belt conveyor which inclined upwards and discharged the lump ore into a 400 ton steel bunker equipped with discharge gates and operating gear for loading the 30 ton steel railway wagons. The fines from the screens was conveyed by fumes and sluices to a Dorr classifying unit and stockpiled. During 1930 construction commenced on a 3ft 6in gauge line from Pepel to Marampa, passing the towns of Lunsar, Rogbere, Moria, Borup and Lungi Loi. This railway was not connected to any of the other railway lines in Sierra Leone. Total length of the line was fifty two miles (84km), with an axle loading of thirteen tons. Trains were organised to haul thirty bogie wagons with each wagon capable of carrying thirty tons of ore. The line was laid with 65lb rail with a maximum gradient of 1 in 125 for the loaded westbound trains and 1 in 57 for the eastbound empties. Maximum altitude on the line was only 190 feet. Engineering works were minimal although seven bridges were required to cross various waterways. Steel sleepers were used over most of the route, with wooden sleepers being used for bridges and pointwork (switches). When the line opened in 1933 two 151 ton coal burning 2-8-2 + 2-8-2 Beyer-Garratt locomotives handled the ore trains, two more were recieved, one in 1935, the other in 1937. The first commercial shipment of iron ore took place during September 1933 when the 'Hindpool' sailed to Glasgow with 8,000 tons of iron ore. During 1934 just over a quarter of a million tons of ore were shipped through Pepel. Vessels up to 100,000 dwt could be handled whilst the large ship loader consisted of two luffing and slewing booms. The rated capacity of the ship loader was 4,000 tonnes per hour. The Hindpool was a 4,897 ton merchant vessel built in 1928 by W Gray & Co Ltd, West Hartlepool and owned by Ropner & Co, also of West Hartlepool. Between 1933 and 1941 it presumably plied the route between Pepel and England transporting iron ore, for on March 8th 1941 the Hindpool was sunk by U-124 on this route. The ship was part of convoy SL-67 with the Hindpool transporting 7,700 tons of iron ore between Pepel and Middlesborough. The ship went down north of the Cape Verde Islands at about sunrise, three other ships were also sunk in this attack. Twenty eight crew members were lost, ten were rescued by a British destroyer and another merchant vessel. The thought did cross my mind that perhaps the Hindpool might be powered by Sulzer engines, unfortunately no, this was a steam powered vessel. After four years of operation it became evident that the large accumulation of washed fines had some commercial value. A belt conveyor was installed to collect the discharge from the classifiers and transport it to a nearby stockpile at the rate of 200 tons per hour, where a drag-line scraper distributed the material over the stockpile. From the stockpile electric mechanical shovels loaded the fines onto the railway wagons. A large deposit of soft powdery micaceous iron ore below the hard lateritic hematite cap was opened up during 1937 and an extensive concentration plant was built. At Pepel, a Marshall car tippler was built for rotating the ore wagons upside down and was designed to unload the washed fines and concentrates on a three minute cycle of operation, enabling twenty wagons or 600 tons of material an hour to be unloaded. Sherwin vibrating equipment was fitted onto the tippler and on the sides of the hoppers beneath it to deal with wet or sticky ore. The ore was then taken by a conveyor belt to a stacking facility which had a capacity of 20,000 tons each of fines and concentrate. The ore was recovered by two drag line crescent scrapers onto a larger conveyor belt, which took the material to a ship loader. By 1938 the open cast mines were producing 862,000 tons of iron ore valued at £647,000 for export to Britain and Europe. Plans were in hand to extend the railway to large deposits further inland at Tonkolili, but these remained only as plans. As a footnote, the first President of Sierra Leone, Siaka Stevens, started work on the construction of the railway for DELCO in 1931 and later became a station master and stenographer at Marampa until 1946. In 1952 the concentration plant with its vibrating tables and sluice machines was replaced with spirals, which increased the concentrate output to one million tons per year. From 1953 to 1959 geological investigations were conducted by Dr Beeck and Mr Wood. A series of 54 boreholes and a number of adits, trenches, pits and banka drill holes were made on the Masaboin and Ghafal deposits at Marampa in 1954. In 1956 the concentration plant was expanded to handle 1.5 million tons per year. Production of the hard red lateritic hematite ore, which capped the Masaboin and Ghafal hills, ceased in 1959. During the early part of 1955 five locomotives were delivered from the Birmingham Railway Carriage & Wagon Co Ltd (BRCW) workshops at Smethwick to Sierra Leone. The power unit was supplied by Sulzer Bros (London) Ltd and the electrical equipment by Crompton Parkinson Ltd. The locomotives were for use by the Sierra Leone Development Company and were designed and built to the requirements, supervision & inspection of Messrs Livesey & Henderson, consulting engineers to the DELCO. The power unit was a pressure charged Sulzer 6LDA28 developing a continuous 1,000hp at 710rpm using six 280mm by 360mm (11in by 14.2in) cylinders. For its use in Sierra Leone the rating was reduced to 850hp at 710rpm. Dry weight of the engine including underbed and mounted accessories was 20,000lb. Tests on a similar power unit had produced 1,300hp at 750rpm with a clear exhaust. The well tried design featured a welded mild steel crankcase with cast steel transversals welded in, and with crankcase side extensions to form the common underbed for the engine & generator. Laterally the crankcase was reinforced by U-shaped main bearing saddles with top caps let into the crankcase structure to act as bridge pieces, avoiding the use of studs. One of the new diesels stands in the snow at Smethwick. Water & oil were cooled in two Serck side mounted radiators, air being drawn through by an electrically driven Davidson fan, the air expelled through the roof. The fan motor was connected to the motor of the traction motor blower group, both running at reduced speed until notch 5 was reached. Ducting for the cooling air was aluminium, each radiator assembly was removeable as a whole unit. The cooling water pump was electrically powered, starting up with the main engine, but continuing to run after engine shut down until stopped by the driver. The engine room was pressurised using two Davidson fans, drawing air through side grilles and downwards into a filter cabinet. This would remove the larger dust particles, large banks of Visco oil-wetted air filters would capture the remainder of the dust prior to the air entering the engine room. Two traps in the roof allowed hot engine air to escape upward, though these traps were closeable in severe dust conditions. The Crompton Parkinson main & auxiliary generators were carried on the common underbed. They were combined on a common rotor of cast steel 'bottle' form, providing a high stiffness/weight ratio. The generator coupling was also integral with the main/auxiliary rotor, a space saving which did not compromise accessibility to these components. The whole generator assembly was a single bearing machine with a parallel roller bearing at the outer end. The bearing was carried in a removeable cartridge, allowing for easy examination without disturbing the end shield which was also the auxiliary generator magnet frame. Hand barring gear was fitted in the inner end of the main rotor for turning the whole engine/generator assembly. The main generator was a ten pole machine with a continuous rating at 535kW at 710rpm 535V. 1,000amp. The rating of the eight pole auxiliary generator was 63kW at 500-710rpm 100V 575 amp. Voltage was maintained constant by a Brown Boveri regulator mounted on the l.t. cubicle. Four Crompton Parkinson force ventilated nose-suspended traction motors were rated at 197hp 300amp 550V one hour, or 165hp 250amp 550V continuous. They drove through single reduction gears of 14:65 ratio. They had plain axle suspension bearings with pad & wick lubrication. Control gear was designed and manufactured by Allen West & Co Ltd. 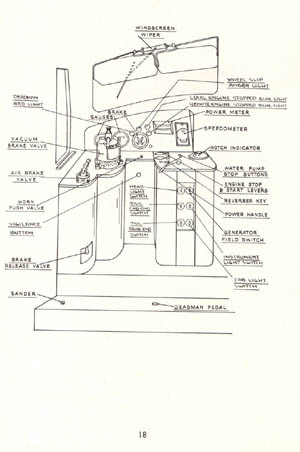 The main control gear was housed in a cubicle near the main generator, control gear for the auxiliary generator was located at the other end of the locomotive. Both housings were dust proofed. The main motor contactor group and the reverser were electro-pneumatically operated, the weak field contactors and all auxiliary contactors were electro-magnetic. Weakening of the traction motor fields was effected automatically in three stages. The main generator is positioned ready for bolting to the underframe. The underframe & body framing were completely welded structures in themselves but were riveted to each other. Double sheathing with outer panels of steel and inner panels of aluminium with Isoflex insulation between was applied to the cab sides and front, the steel bulkhead had asbestos insulation. All controls not deemed essential in driving the locomotive were positioned away from the cab in lockable cabinets, accessible only to authorised personel. In light of the extreme condensation encountered windscreen wipers were fitted on both sides of the glass. Fuel and batteries were positioned on the underframe between the bogies. The main tank held 665 gallons, supplying a 50 gallon auxiliary tank in the engine room. The nife nickel-cadmium batteries were mounted on sliding rails either side of the fuel tank. The fully welded bogie frames were stress relieved as single units. The main members of the bogie were box shaped, utilising the open box form to allow the side members of the frame to accomodate the equalisers. All vertical loads, traction & braking stresses were taken centrally and all in line on the main frame members of the bogie. Nests of helical springs formed the complete suspension between between the equalisers and the bogie frame. The springs were supplemented by shock absorbers which acted only on their return stroke. Side movements of the swinglinks were controlled by rubber springs. The Timken roller-bearing axleboxes had thrust faces of manganese steel bearing against liners of the same material. Westinghouse straight air brakes were fitted to the locomotive with vacuum equipment for the train brakes. There were two blocks to each wheel and four air cylinders per bogie. Sulzer's patent anti-slip brake was fitted to the locomotive to facilitate starting under poor conditions and came into use automatically whenever the air sanders were used. Two diesels were operated back to back in multiple on trains of forty double bogie ore wagons of thirty tons carrying capacity. With the line limited to a top speed of 28mph, a round trip would take about five hours to complete, not including any time taken at the termini. During the mid 1960's improvements to the track allowed the axle loading to increase to 16 tons, with the maximum speed increased to 35mph. New roller bearing equipped wagons had an increased capacity of fifty tons. 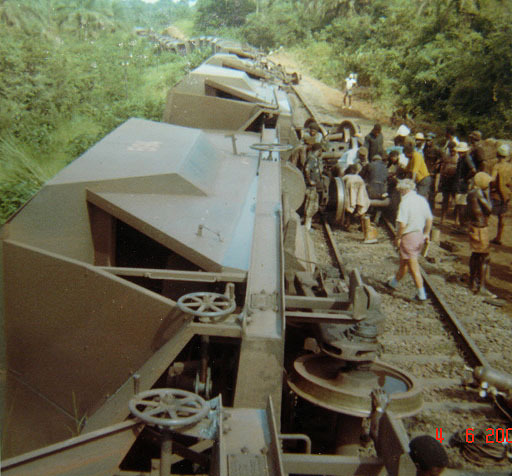 A pair of the diesels on location in Sierra Leone. The Annual Review Number of the Diesel Railway Traction publication from February 1958 featured a colour image of two of the SLDC locomotives on the cover. The view is possibly taken at the Pepel facilities. The views below are from SLDC publicity material featured in a small book produced about 1961 featuring all facets of the mine, railway and dock facilities. 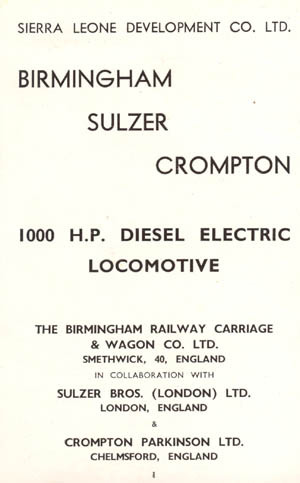 The cover of the publicity booklet featuring an iron ore train led a pair of the BRCW/Sulzers. An interesting view of a pair of locomotives working a train of empty iron ore wagons. Interestingly the locomotive facing the photographer has an extra headlight mounted on the nose front. Also noticeable is the strategy for the use of the sleepers. The metal sleepers (ties) were used extensively on the line with the exception of the points (switches) - here wooden sleepers were used. Another view of the train shown above. The location is at Pepel, the line just visible to the left leads to the unloading area where the ore would be fed into conveyors leading to the ships. The train shown is climbing a steep incline to reach the main line to Marampa. I am uncertain as to why this line was constructed at a lower level. Number 104 in the Workshops, presumably about to be lifted off its bogies. It is not readily apparent in many of the publicity views but from this view it is obvious that the nose end contained an access door. A view of the processing facilities at Marampa showing a twenty wagon ore train be loaded in charge of a small shunting locomotive. Another view of the Marampa processing facilities. A Ruston-Bucyrus bucket loader seems to make easy work of filling the ore cars. An ocean view of the facilities at Pepel showing the ore dump which received the ore from the trains from where it was transferred to the gantry/conveyor for delivery to the ships. This view compares well with the November 2009 views, although at some point the unloaded ore dumps were moved from the location in this view to an area further west. The views above & below are typical of the smaller iron ore carriers that came to Pepel to ship out the ore. An email from Wijnand Romijn advised that he made two trips to Pepel during February 1963 on the bulk carrier Tweelingen (managed by Scheepvaart Mij. Zodiak, Rotterdam). He writes that the crew were not allowed off the ship, but the local natives did board the ships to make deals for cigarettes or old tin cans. It would take about two days to load the ship, the ore was bound for Rotterdam. The Tweelingen also visited Narvik & Kirkenes to load iron ore, the contrast between the cold climate of Norway and the heat of Sierra Leone was noted by Wijnand, who also remembers the locusts that flew into the area and inundated the ship. A view from the top of the shorter loading gantry conveyor showing an empty ship receiving its load of iron ore. The electrical power required to run the port facilities was generated in a power station adjacent to the the railway workshops. The serious amounts of power needed was generated by horizontal low-speed Crossleys. The 1960's brought further growth and prosperity to the mine, railway line and port facilities. DELCO completed a $25 million expansion of the Marampa mine. New facilities included a new $7 million ore-loading pier, power shovels and a concentrating plant. The new facilities increased the mine capacity by 40% to 2.8 million tons per year. A sixth BRCW locomotive was added to the fleet in 1960 and during the mid 1960s the railway track was rebuilt, with rail of 60 lb/yd (pre-1967) or 80 lb/yd (post 1967). This permitted the axle loading to be increased to 16 (or 17?) tons, and the maximum speed to increased to 35 (or 30?) mph. New roller bearing equipped wagons were introduced which had an increased capacity of 50 tons. The line had a rated capacity of 2.5 million tonnes per year with a maximum train weight of 2,510 tonnes. The rated maximum useful load per train was 1,630 tonnes. Loaded and empty trains met at Mile 26, at the village of Rolforade. A ballast loading station was located at Mile 29, with a quarry supplying high quality ballast nearby. During 1964 one of the BRCW locomotives was replaced by an ALCO diesel electric locomotive numbered 201. In 1967 the port of Pepel was dredged, allowing vessels upto 40,000 tons to use the facilities. A year later a major contract was established to supply iron ore to three Japanese steel mills. The deliveries totalled 400,000 tons between April 1968 and June 1969 with annual shipments of 1.1 million tons per year for the following 10 years. Additional sales on the open market, in particular to European countries saw iron ore production reach three million tons. These contracts led to a considerable expansion at both the Marampa mine and Pepel. The port facilities at Pepel were improved to allow the docking of 100,000-ton ore carriers, and raised the loading capacity from 2,750 tons per hour to 4,000 tons per hour. A 250,000-ton additional stocking capacity also was added at the port during 1969. Improvements at the concentrating plant of the Marampa mine were made in the sizing and concentrating sections, to give a minimum 3.1 million ton total capacity in 1970. Three more ALCO’s were delivered during 1970 (numbered 202 to 204), now built by the Montreal Locomotive Works. These ALCO’s were responsible for the gradual run down of the fifteen year old BRCW's. The concentrator at the mine was modified in 1973, and a dam to store water was completed. Hello, I was really fascinated to find on your site an article about the railway from Pepel to Marampa in Sierra Leone. During the period 74/75 I was in charge of the workshop on Pepel Island. I was there with my wife and two young children and it was a bit like living in paradise. Even then the Sulzers were a bit tired, (we also tyred them). They were in more or less constant use but we had one ALCO when I arrived and took delivery of one whilst I was there and we began to rely heavily on these. Unfortunately we put tyres on one of the ALCOs.....It made a light run to Marampa okay and back to the passing place, (forget the name of the little station), but in attempting to pull away all the tyres came off! Talk about steep learning curves for an ex-marine engineer, that was a real mess to sort out seeing as our heaviest tools were 25 ton Tangye jacks. (Its definately a small world - the firm of Tangyes Ltd, best known for its hydraulic equipment was, like BRC&W, based in Smethwick). The first Alco to arrive at the SDLC was numbered 201 during 1964 (Alco b/n 3377.01), with Co-Co wheel arrangement). Three more arrived during 1970 numbered 202 - 204, now built by the Montreal Locomotive Works (M6039.01-03, model # DLK543). No doubt these locomotives were responsible for the gradual run down of the BRCW's. Dennis also advises that somewhere in the undergrowth was a very modern (for the 1970's) Badish lining, levelling and tamping machine that the permanent way gang spent a year attempting to commission. They were not successful and reverted to the more normal equipment used by the gangers - little rail cars powered by Ford 105e engines. Taking a ride on one of these cars was deemed quite an experience. Additionally, a short walk from the rail shed was a power station whose output was used to power the iron ore conveyors and reclaimer systems. The engines used were horizontal low speed Crossleys. From Dennis's files comes these four views of daily happenings on the railway. Three views show the derailment of an empty ore train - by this time the Alcos were in charge of the workings. The fourth view shows a social event taking place, but of interest from the railway point of view are the stacks of new metal sleepers on the right handside of the photograph. Dennis advises that the railway had little in the way of rerailing equipment. In the derailment scene above track was laid around the wrecked wagons to get the line re-opened. The primary piece of equipment used were hydraulic jacks on traversing slides and an improvised 'A' frame, constructed in the workshop and mounted on an old flatbed wagon. This was used to recover most of the bogies and put them in a purpose laid short siding. Some wagons were recovered by jacking them up, adjusting the track and sliding bogies under them. At the end of 1975 the iron ore mining operations of DELCO ceased and the company was placed into voluntary liquidation following continued heavy losses. Three loans from the Sierra Leone Government totalling £2.25 million over the previous two years had been granted in an effort to allow the mining operations to continue. Ongoing negotiations with the Bethlehem Steel Corp. of the United States eventually came to nothing. This was at a time of a global decline in the steel industry. Continued searches by the Sierra Leone Government for a company to take over the operation proved fruitless. The maximum annual output from Marampa during the DELCO operations had been 2.5million tons per annum and during the period 1933 - 1975 approximately 60 million tons total had been exported. A similar amount was still believed to remain un-mined at Marampa. In 1977 the Geological Survey of Sierra Leone estimated proved tailing reserves of 45.5 million tons with an average iron content of 19.75%. When the mine, railway line and port facilities were operated by the Sierra Leone Development Company they were but three parts of one organisation, and with the end of the iron ore mining all three parts fell into disuse. However the Government of Sierra Leone recognised the importance of securing the port and railway facilities at Pepel for further use. To do this facilities were placed under a care and maintenance program to provide some sort of stability to the facilities. In 1981 Austromineral GmbH, a subsidiary of the Austrian state-owned firm of Voest-Alpine AG evaluated the tailings and hard rock deposits at Marampa. It estimated total tailings reserves of 51 million tons averaging 28.6% iron content and total hard rock reserves of 84.5 million tons averaging 37.4% iron content. A further 10 million tons of hard rock reserves averaging 41.1% iron content were measured adjacent to the Marampa concession. The mine was reactivated in November 1982 with a dredging operation of the tailings on an artificial lake. The tailings were concentrated using Reichert Cones, followed by high intensity magnetic separation. The mining and concentrating operations were designed and built by Austromineral under contract to the Government. The expected annual production of one million tons was never reached, producing only 420,000 tons in 1983, 355,000 tons in 1984 and 70,000 tons in 1985. Austromineral was unable to meet its operating costs and debt repayments to modernize its equipment on a $15 million loan from the Austrian Kontral Bank. Worsening inflation also caused the price of diesel fuel for its electrical generators to increase from $1.00 to $2.40 a gallon. Austromineral closed down the mine, rail and port facilities in 1985 and handed back the assets to the Government. The following views date from 1982 & 1983 and come from the personal collection of Robert Hauser. Three views of some of the railway facilities and stock, believed to be photographed in the Pepel area (see notes below). (Left view, above) One of the Alco's marshalls a short train, most likely at Pepel. To the right of the nearest wagon appear to be some substantial timbers, possibly sleepers (ties). Just visible in the left distance are some of the ore wagons. (Center view, above) Brake van (caboose) No.323 draws the attention of some children. The caboose is slightly different than the one in the left view, this one appears to have a mobile ramp housed just inside the doorway and lacks the windows in the cupola. From other pictures received it was used on some type of working for employees or locals. (Right view, above) A well kept signal cabin, not sure of the location. Six years after the mining ceased at Maramapa, civil war engulfed the country in 1991. The armed conflict between the Revolutionary United Front (RUF) and the one party government led by Siaka Stevens, resulted in tens of thousands of deaths and the displacement of more than 2 million people, many of whom became refugees in neighbouring countries. Siaka Stevens was overthrown by a military coup in 1992, led by Captain Valentine Strasser, who was subsequently overthrown in a second military coup in 1995. Democratic elections were held in February 1996 and Dr. Ahmad Tejan Kabbah was elected President. In May 1997 a combination of RUF and rebel government military forces overthrew the elected government. Troops from the Economic Community of West African States (ECOWAS) and the United Nations assisted in the restoration of the elected government in 1999. Rebels invaded the Marampa mine in the mid 1990’s and most of the infrastructure was destroyed or stolen. This included the destruction of all the mine records and plans when the mine administration building was burnt down and the indiscriminate trashing of all the drill cores. The railway line was used briefly for the removal of the most of the remaining infrastructure at the Marampa mine. Despite the failing light on February 1st 1997 John was able to capture 104 on film in the very twilight of its life. Forty two years have gone by since delivery from Birmingham, the shiny paint is long gone and 104 is now reduced to the status of a tool shed, the body shell is completely gutted. What happened to the original nose yet remains to be answered. "104 was at Pepel Island standing outside the Locomotive depot where there were also two EE 0-6-0DH (one is just visible behind 104) and four ALCO's. The ore wagons and a Smith Rodley crane dating from the opening of the line were also here. Although the line had not operated for some years there were still sixteen staff present including a foreman who had been on the line since 1955. The whole lot was being maintained on a care and maintenance basis for who knows what. Whether this lot has survived the latest round of civil unrest is anyone's guess (although its so remote and isolated that I would guess its all still intact). The foreman stated that everything else on the 3'6" gauge line had been scrapped although some narrow gauge equipment remained at the mine which was inaccessible except by helicopter, (the mine had 2'0" gauge RH & OK diesels). The main line track from Pepel to the mine is intact although completely overgrown with trees and completely impassable. The bridge over to Pepel Island is the only usable piece of line (about 300 yards) which has a 4-wheel flat wagon pushed by hand which is the only way to reach the shed and port, there is no road access. To get to the bridge involves some real bundu bashing down a four wheel drive track through the jungle. You have to go with someone who knows the way! Once you get to the shed the staff keep the shed yard reasonably tidy and even stated that they started up one of the ALCO's once a month or so to keep it in working order, one of the EE's also appeared to be in working order. The depot is a very well equipped workshop". During 1999 the elected government returned to power assisted by troops from the Economic Community of West African States (ECOWAS) and the United Nations. Unrest continued but gradually diminished with international help, such that during early 2002 President Ahmad Tejan Kabbah was able to declare the armed conflict over, supported by the British Government and the United Nations Mission in Sierra Leone (UNAMSIL). Contributions from the World Bank and the international community assisted in the demobilisation and disarmament of the RUF combatants, this was completed by the end of 2002. Elections held in May 2002 led to President Kabbah being re-elected for a five-year term with a clear majority. During 2003 a local company, Tecsbaco International Incorporated Company applied for a mining lease for the Marampa Iron Ore concession, which was granted and allowed them to sell the remaining Government owned concentrate at Pepel. In August 2003 they obtained an exploration licence over the Marampa mine site. During 2004 the Pepel port loading facilities were refurbished by Tecsbaco. The following information & pictures comes from a correspondent who visited Pepel during December 2004. As can be seen from the views the state of the equipment at Pepel varies from derelict to serviceable. The line north east from Pepel to Marampa was still intact but overgrown most everywhere - thieves would later remove some of the rails for their scrap value (see below). It is presumed that the internal civil unrest which has been endured by Sierra Leone for the past two decades did not cause much damage to the infrastructure at Pepel due to its remote location. There is now a great interest in the bauxite deposits near Port Loko, which ironically sits astride the former DELCO Pepel - Marampa iron ore line. So it is conceivable that the line and the ship loading facilities may once again see activity. The Bridge to the Pepel Facility. As mentioned in John's text above the access to Pepel is via a bridge, the method of propulsion seen here. Note the mixed wood and metal sleepers. Shunter 151, lettered for 'Marampa Mines' stands outside the facility, to the left is the last 'intact' BRCW diesel electric - now in use as a tool shed. Inside the facility missing both bogies is 204, which seems like it could be put back into service with a minimum of work! The arrival of the first Alco in 1964 and three more in 1970 would mean less and less work for the aging BRCW built locomotives. The Alco DL-543 was quite a significant locomotive, being the first Alco 12-cylinder export model built for less-than-standard gauge tracks. There was nothing in the history of the SLDC's Alco or BRCW locomotives that might suggest any common thread, but the fitting of AEI electrical equipment to No.201 certainly provided a thread to later Sulzer powered locomotives that worked in Africa. It is not known if the three MLW cousins were equipped with AEI electrical gear. SLDC may have wanted it for standardization purposes, but on the other hand it was a period when the Canadian Government appeared to be helping MLW in the export market with special loan terms, etc., so that may have mandated GE Canada equipment. It's interesting how AEI transferred its GE-inspired electrical gear to other locomotives. 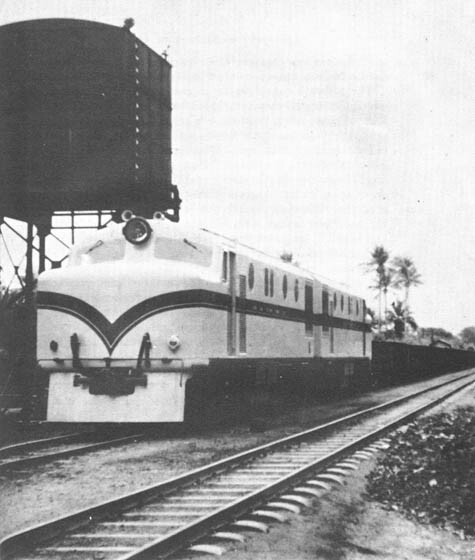 The AEI 253 traction motor was quite widely used, even on the English Electric 22 class for Malaysia, which was otherwise very EE. The main generator with gear drive auxiliaries was used on the Australian Commonwealth Railways NT, and also on the Nigerian Station class locomotives. But the Zambesi class had more-or-less followed BTH precepts, even though it post-dated the arrangement with Alco, which was announced late 1959. When Nigerian Railways wanted a US-style 8-notch control for the Station class, it would have been easy for AEI to do this, but Sulzer produced a special version of its governor, for these alone as far as is known. A world of strange connections. 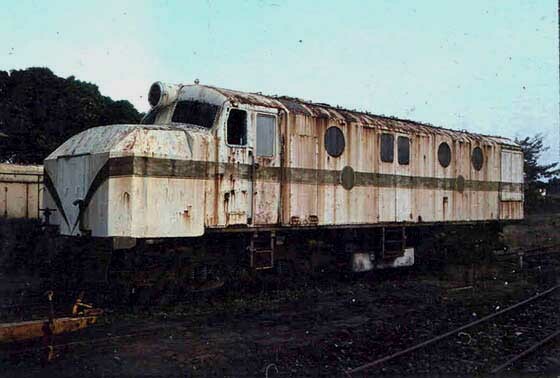 SLDC had its version of the Australian Commonwealth Railways NSU, which was the main antecedent of the Zambesi (the BTH Explorer and BR Class 24/25 being the others). Then it received the DL-543, which used the same electrical equipment as on the Station class and the NT, both Zambesi derivatives. (Thanks to Steve Palmano for the history lesson). As mentioned by John one of the 'BRCW's' was somewhat intact as is seen here in this view in the yard. Almost gone, but not quite! 101 is little more than a shell, some panelling and a few miscellaneous pipes, all other fittings and metalwork has been removed. Beyond in the trees sits another derelict locomotive. Equally gutted is 104, although a little of the paintwork remains on the nose. From the above view comes this enlargement of the space to the right side of the derelict 104. If one ignores the goats, to the right side of the view appears to be some of the bogie frames from the BRCW's and sitting on top of them is the engine/generator frame and bedplate of one of the Sulzer 6LDA power units. The state of the railway near Rogberi Junction. In February 2005 Tecsbaco secured a 25-year mining licence over the Marampa mine site. This license was transferred to London Mining PLC during February 2005 (see further notes below). During April 2005 about 10km of railway line west of Rogberi became the target of scrap metal thieves. Sleepers and other metal fittings were removed, some were recovered when the thefts came to light. Studies conducted with regard to the feasibility of re-opening the line indicated the stolen sleepers and rails could be replaced by the stock recovered and using sleepers and rails from east of Rogberi, the thought being that the shipment of bauxite would occur much sooner than that of the iron ore from Marampa. Further thefts continued during November 2005, this time affecting 12.5km of the Rogberi–Lunsar line, with the thieves focusing on the metal sleepers. The stolen materials appeared to be destined for overseas markets, fortunately some of the materials were recovered whilst in transit locally. In an attempt to halt this traffic the Government banned the export of scrap metal. The Marampa mine site had also suffered from illegal scrap collection. In December 2005, London Mining commissioned a hydrographical survey of the Pepel channel and harbour to estimate the dredging costs. They also commissioned the clearing of the Pepel port area and the clearing the Pepel to Marampa railway line of all vegetation so that the rail engineers could make a proper assessment of the railway track and infrastructure. During December UNAMSIL pulled the last of its troops out of Sierra Leone due to the success of its peace mission. Whilst the focus of this story centers on Pepel & the mine at Marampa the railway line passed through an area of another valuable mineral. The area of interest covered approximately 257 square miles in the Northern Province, with bauxite being the mineral of interest. Although discovered in the 1950's these bauxite deposits had not been mined, other bauxite operations in Sierra Leone had ceased operations during 1995 due to the civil unrest. This location was bisected by the abandoned Marampa - Pepel which drew interest as a possible means of transferring the ore to the port if mining were to commence. The railway line was to all intents abandoned but as mentioned earlier the railway & port facilities at Pepel had been maintained on a care and maintenance basis by the government. The Northern Province (Port Loko) bauxite license had been held by the Sierra Leone Ore and Metal Company (Sieromco) - a subsidiary of Alusuisse, but this was given up as the company rethought its mining strategy - they had mined bauxite in parts of Sierra Leone from 1963 - 1994. Austromineral had showed interest in the bauxite deposits, as mentioned elsewhere this company had reopened the iron ore mine at Marampa. The concession was acquired in 1992 by Jupiter Export-Import Ltd. Their activity was low key due to the civil unrest but during March 1996 an application was filed with the government for the 'Lease of the Pepel Port and Railway Installations and the Rail Tract'. Regrettably the increasing instability within the country led to the suspension of operations in 1998 and the cancellation of the license in 1999. Explorations rights were granted late in 2002 to Gondwana for the Port Loko bauxite concession following more settled conditions within Sierra Leone. If the bauxite operation had come to fruition the processed ore was to be sent by pipeline to Rogberi Junction for trans-shipment to the railway. Rogbere Junction is approximately 64 km from Pepel. The saga continues - the mining lease issued to Tecsbaco in February 2005 was eventually used for purposes outside of its original intent, made possible by the Sierra Leone Ministry of Mines advising that mining companies can sell scrap metal from their mining sites. The term scrap metal was ill defined and a plan was uncovered that to all intents and purposes would have seen the complete removal of all metal from Pepel, including the remaining locomotives and rolling stock, the powerhouse and the loading facilities. Some rail, sleepers and at least fifteen ore cars were scrapped, although some of the material was confiscated prior to its export. The existing mining lease was cancelled and a feasibility study continued with regard to the mining of the bauxite at Port Loko. So for the time being the remnants of the BRCW/Sulzers, the Alco's and the other locomotives remain with an uncertain fate. June 20th 2005, Pepel, the carcass of 104. Everything removeable has been removed, but a little of the paint still shows. Presumably in their entire career at Pepel the locomotives never received a repaint? Pepel 2005, the railway workshops with a variety of equipment on display. Although iron ore production at the Marampa mine had long since ceased the mine area still held something of value. The sixty years of activity at the mine had produced tailings, estimated at 50 million tons, located in a number of tailing dams at Marampa. Whilst the tailings contained iron ore, when the ores were originally mined either the refining processes could not retrieve all the iron available within the ore or the cost of doing so was uneconomic at the time in relation to the market price of the refined ore.
During July 2007 the Marampa tailings were tested at the request of the London Mining PLC. Using a modern refining process the tailings were able to yield a product containing 66% iron at a recovery rate greater than 80%. A pilot plant set up to further test the tailings supported the original findings. With an annual estimate of processing three million tons of tailings per annum the production would run for approximately six to seven years. The considerable volumes involved led to the possibility of the processed ore being shipped from the Marampa mine site to the ship loading facilities at Pepel using the existing railway infrastucture, after repair and refurbishment. With this in mind, late in August 2007 London Mining PLC signed a Memorandum of Understanding with the Government of the Republic of Sierra Leone for the lease of the railway line from the Marampa mine to the Pepel port as well as the Pepel port and its facilities. 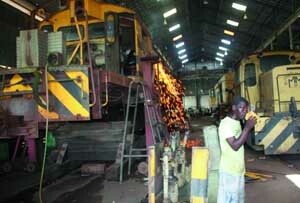 Although the Sierra Leone Government would oversee the fixed rail and port facilities, London Mining PLC would be responsible for the cost of repairing and refurbishing these facilities. The assets which were to be transfered to London Mining PLC including the locomotives, rolling stock, scrap metal and approximately 60,000 tons of iron ore fines concentrates at Pepel. Further interest in the railway and the port facilities were shown by African Aluminium Ltd (bauxite mining) and African Minerals Plc (diamond & iron mining), development which was welcomed by London Mining in order to share the costs. At the site of the Marampa Works all the derelict buildings and concrete structures were levelled, whilst the main office building was to be repaired complete with a refurbished roof. The review of the 84km railway line found issues with the original 187,000 sleepers and the 748,000 Pandrol clips that secured the rails to the sleepers. Items missing included 707 meters of rail, 46,000 sleepers, 406,000 Pandrol clips, 3,000 fish plates, 6,000 nuts and bolts and 12,000 washers. The vast majority of the rails that remained in place were generally in good condition having been installed a year before the line closed. However approximately 5,000 meters of rails did require replacement. It was also noted that in four places derailment damage was visible on the sleepers. Other permanent way projects were related to clearing and restoring various structures (bridges, culverts etc) along the route after years of neglect and uninhibited growth of trees and other vegetation. One major part of the trackbed restoration was the requirement of up to 20,000 tons of ballast which would be available from mothballed quarries along the line or from active quarries at Port Loko and Freetown. Also present at Pepel were seventeen ballast wagons in reasonable condition and ninety iron ore wagons loaded with iron ore concentrate. More ominous was the identification of all scrap metal at Pepel - this would no doubt be the end of the carcases of the BRCW/Sulzer diesels abandoned and partially dismantled so long ago. One of the first commitments was to repair and upgrade the Shengbe Bridge to allow road and rail access. Developments into early 2008 involved a study of the railway recommending the line retain its 3ft 6in (1,067mm) gauge which would provide a capacity of just over 10 million tons per annum. During April 2008 Dr Ernest Bai Koroma, the President of the Republic of Sierra Leone officially opened the refurbished joint railway/road bridge near Pepel. A report produced for the government of Sierra Leone by UK based railway engineering consultants Scott Wilson Railways took a detailed look at the operating capacity of the line with regard to its use by multiple users. Using one (existing?) 2,000hp locomotive 25 wagons carrying 1,100tons of concentrates could be hauled along the existing railway track. After refurbishment and with one passing loop six train sets could provide nine services a day, six days a week, with an annual capacity of just in excess of three million tons per annum. By adding passing loops and doubling train lengths would increase annual capacity to 10 million tons per annum. Increasing axle loadings, conversion to 4ft 8½in (1,435mm) standard gauge and using 3,000hp locomotives would result in greater capacity but with a major increase in costs related to gauge conversion and re-engineering of the route for heavier trains with higher axle loadings. The Scott Wilson Railways report recommended retaining the current narrow gauge line. Part of the costs of the Scott Wilson Railways study had been shared by African Minerals Ltd, a Cayman Islands-registered company who early in May 2008 entered into an exclusive Memorandum of Understanding (MOU) with the Government of Sierra Leone to complete a study with regard to converting the railway line from narrow gauge to standard gauge! Following the study it would upgrade the line, maintain it and operate it on a commercial basis. London Mining PLC began investigating the validity of African Minerals’ announcement and its own Memorandums of Understanding with the Government of Sierra Leone. Although the concerns from the two companies had much validity the concerns when they were narrowed down were minimal. London Mining PLC's license primarily involved the mine at Marampa and a specified area around the mine. African Minerals license was more extensive, their surveys covered over half of Sierra Leone and included land in the vicinity of the Marampa mine. Their surveys discovered that the iron ore deposits in the Marampa area were more extensive than first thought and extended beyond the geographical limits of the London Mining license. To whatever extent these boundary claims were legitimate (the differences between lines drawn on maps versus markers on the ground) the conflict was resolved leaving London Mining to go about its business at the Marampa mine and African Minerals to handle to bauxite operation in the Port Loko area. An article in the The Globe dated Saturday November 15th 2008 featured reports of friction between workers from London Mining and African Minerals, allegedly African Minerals were operaing in a disputed area of land. The article also included two views from the railway workshops at Pepel, showing the cutting up of one of the Alco locomotives. If this was part of an exercise to remove unwanted scrap from the Pepel area then it would explain the disappearance of the carcasses and other stripped components of the BRCW diesel locomotives. A look at satellite images of the Pepel area still reveal much of the infrastructure from the iron ore activities. The main locomotive repair shed is clearly visible including the intact BRCW locomotive in the yard. To the south towards the ship loading gantries are several long lines of ore wagons. The route of the line can be followed for many miles but several section of the satellite imaging are of poor quality, including the Marampa area. The following views were taken on a brief visit to Pepel on November 2nd 2009. The photographer, Richard, had spent many of his childhood years in Sierra Leone, his parents being missionaries in the Freetown area. The growing civil unrest had caused the family to leave during 1995. As stability returned to Sierra Leone the family looked for the opportunity and timing to make a return visit. When this took place in October/November 2009 one of the items on the list of things to do was to visit Bunce Island, an important location used in the processing of slaves for transport to the British colonies in America. To reach Bunce Island it was necessary to charter a small boat from Freetown, Bunce Island is also very close to the port & railway facilities at Pepel. With an interest in railways Richard couldn't pass up the opportunity to be dropped off on Pepel Island to visit the facilities! The photographs below are taken from his very brief visit. A motorcycle taxi was used to get him from the drop-off point to the facilities, then a hurried dash to see as much as possible before a quick return to the boat, where the boatmen and Richard's family were patiently waiting, still with an hour's journey back to Freetown and with the afternoon light drawing in. Three views of the loading facilities at Pepel, November 2nd 2009. The three views above show the two oreloading gantries at Pepel. These can be compared with views found earlier on the page, particularly the view of the Hindpool. The right view shows both oreloading gantries. The nearer one is the shorter one seen in the left photograph from the shore with the abandoned boat, whilst the more distant gantry, with two loading points also features in the center view taken from the shore. The umbrellas provided to the passenger (for the rain or sunshine?) are all imprinted with images of US President Obama. Three views of the locomotive servicing & repair facilities at Pepel, November 2nd 2009. The three views above show the shed yard and inside the shed. The left view looks towards the servicing & repair facilities, to the right is perhaps one of the original iron ore wagons which has now been modified for other purposes (ballast work?). The center view looks back from the shed entrance across the yard to the location of the left view. The upturned metal components in the right of the photograph appear to be fuel tanks from one of the Alco locomotives. The right view show No.203 gathering dust, but seemingly pretty much intact and awaiting its next call to duty. Will this ever come? Behind No.203 are the two shunters and out of view to the right, just inside the shed is Alco No.204. These shed views suggest some sort of tidy up has taken place. The BRCW/Sulzer storage shed has been moved (scrapped? ), the shunter No.151 has been placed in the shed and the area generally cleaned up of junk. Richard's time in this area was brief, but from the views taken it appears that possibly all the scrap equipment previously to be found in the surrounding areas amongst the bushes and trees is now gone. Three miscellaneous rolling stock views at Pepel, November 2nd 2009. When operations finally ceased on the railway it appears that the vast majority of the rolling stock was returned to Pepel for storage or disposal. The three views above show the resting places of many of the wagons, many of which have probably not turned a wheel in twenty five years. The left view, looking northwards shows the primary location for the storage of the iron ore wagons, situated in the main yard south of the guard shack/radio tower and north of the power house. When the wagons were abandoned many were loaded with ore, over the years these wagons are now sprouting a fine growth of grass! The center view, looking southwards shows the yard where all the wagons are dumped, included in these storage lines are a number of the original wagons from the 1950's. Barely visible on the extreme right are a set of lines almost lost in the dirt. These lines drop down into the lower area, and are believed to be shown in one of the black & white views above with the train drawing up the incline. The right view, looking north towards the guard shack and supply buildings, show the north end of the yard and the base of the radio tower. Two cabooses are visible in this view, whilst a third is barely visible in the far distance next to the corrugated supply building. Three miscellaneous views of the facilities at Pepel, November 2nd 2009. The left view shows the empty office/administration building as viewed from the river channel. To the right is the short loading gantry, behind this was the original storage area for the ore awaiting trans-shipment from the railway to a ship. Just visible at the base of the large building is a large ancient cannon pointing out to sea. The new sign above the abandoned boat reads 'African Mining, Pepel Port & Rail Project.' The security guards at the facility were provided by African Mining. The center view, looking north shows the building containing all the power equipment. To the left runs one of the conveyors which connects with the main stockpile of ore. When the facilities were abandoned about 60,000 tons of processed ore remained at Pepel, either in the stockpile area or in many of the railway wagons. The right view shows part of the stockpile and one of the giant wheel buckets used to handle the ore pile. The mining licence acquired by London Mining in 2006 provided for production of 1.5million tons per annum from the existing tailings at Marampa. An additional 1.5million tons per annum could also be obtained from the hard rock portion of the resource. If all that is necessary to commence mining falls into place London Mining would modify the shipping route to be taken by the ore. Trucks would convey the ore for the first 40km using new and existing roads, it would then be taken 60km by barge to floating cranes which would hand it over to ocean going vessels. As mentioned earlier the concession granted to African Minerals for the exploration of parts of Sierra Leone carried the risk that nothing of any significance might be found with no viable return on the expenses incurred. On the other hand risk taking can have its rewards and it appears African Minerals have certainly hit paydirt with regard to the discovery of extensions to the iron ore bearing strata in the Marampa area and the huge find at Tonkolili in the Sula Mountains Greenstone Belt east of Marampa. Initial drilling suggested reserves of five billion tons of high quality concentrate grading in excess of 68% iron at a mass recovery of over 30%. Further extensions of the drilling suggests total reserves may exceed 10 billion tons. Shipment of this ore would require the building of a 190km heavy haul railway from Tonkolili to a new deep water port to be constructed at Tagrin Point. An initial study of the route for the railway suggests no major engineering issues. The planning strategy also called for the refurbishment and renewal of the Pepel Port and Pepel – Marampa railway system to support the potential to ship hematite concentrate and create an early cash flow for the company. In September 2010 African Minerals recieved a small shunting locomotive from RRL Grindod, South Africa to assist in the reconstruction and further extension of the railway line to Marampa. This locomotive was RRL DH-01 an 0-6-0DH Krauss Maffei 18597 of 1959 which last worked in 2010 on the RRL gold mine contract in Welkom, South Africa orig; Vecor, Vanderbijlpark. 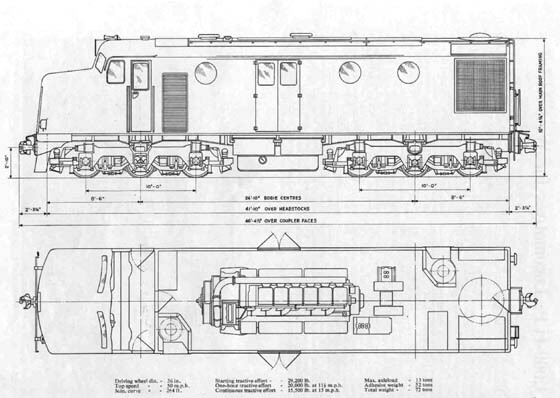 The fitters at Welkom did not like the highly non-standard Kr-M. A second powered vehicle to arrive was a ballast tamper, referred to in some reports as a locomotive. It has also been reported that when the mining operations are fully up and running it is exported that a fleet of seventeen locomotives will be needed. It is believed these will be remanufactured/refurbished rather than brand new machines. Well its amazing what you find on Ebay, in the autumn of 2003 a drivers operating manual for the BRCW's came up for bid, having pretty much outlived the diesels it was meant to explain. It is publication # A11136 dated June 1955 (first edition) with 32 pages. It has some lightly pencilled notations amongst the pages, particularly concerning the operation of certain components. Shown below are the inside front cover and a schematic of the driver's controls. Diesel Railway Traction, March 1955 & Railways of North Africa, John R Day, 1964. Moydow Mines International Inc. September 23rd, 2005 Port Loko Bauxite Project 1. London Mining PLC quarterly operations report dated September 30th 2007 & March 30th 2008. African Minerals Interim Report June 30th 2009. Page last updated November 5th 2011.